IT'S A QUESTION that needs answering. The regular TT is an amazing bit of kit, with strong performance, unique looks, superlative cabin ambience and lots of enticing equipment. However, intellectually speaking, my concern has always been that it's based on the VW Group's MQB platform, which means that it shares a lot of its underpinnings with cars like the VW Golf and, er, Skoda Octavia. Luckily the MQB platform is extremely well engineered and adaptable to many applications, including sporty coupes like the Audi TT. But here's what's been troubling me ever since piloting the Mk3 TT: exceedingly competent though it is, it doesn't quite have the hard edge of a true-blood sports car  it's more suited to a touring role, and enthusiasts still find themselves gravitating towards the Porsche Cayman. So the more focused TTS is an enticing prospect indeed. 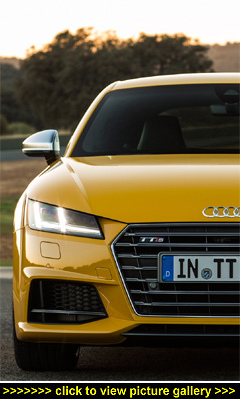 It takes the TT formula and breathes fire into it. Power goes up from 225bhp in the regular TT to 305bhp in the TTS, all from the same basic 2.0-litre four-cylinder TFSI engine. Thank a bigger turbo, intercooler, modified pistons, beefier con-rods, reinforced crankcase and uprated valve springs for that. There's masses of torque, with the peak of 280lb ft being delivered all the way between 1,800 and 5,700rpm. Below 1,800rpm there's pretty much nothing going on so you have to remember to keep the rev-counter in the sweet zone. Acceleration is rapid  so rapid in fact that you often find yourself reaching the 6,800rpm redline before you're fully ready for it, requiring deft up-changes in the six-speed manual version. I suspect that most buyers will opt for the excellent S tronic semi-automatic transmission, whose �1,480 premium is justified by the easier driving experience (especially around town), slightly better mpg and CO2 figures, and a faster 0-62mph time (4.6 seconds versus 4.9). As well as meaty performance, the TTS's engine note also has plenty of beef. This is a deep-throated sound  the sort of noise you really don't associate with a four-cylinder engine; more like a six. What about handling? Take it as read that it's extremely sure-footed. As with all MQB-platform cars, the turn-in is crisp and confident, and there's a reassuring feeling of the car being very planted on the road. That's helped by the TTS's standard quattro four-wheel drive and magnetic ride dampers. You can also select from five drive modes, including Dynamic, which really sharpens the car up, albeit at the expense of some ride quality. With its all-LED lights, bespoke wheels and unique seats, the TTS looks very special both inside and out. Painted as it was in the startling and unique-to-TTS 'Vegas Yellow' (a �545 option), my test machine was even more striking. The TTS is launched initially in Coupe form and priced from �38,790. A Roadster version is already hot on its heels, and for an extra �2,135 you can have one from June. I also fitted in a drive of the new TT Roadster in non-S guise (Yep, I know, it's a terrible job but somebody has to do it!). It's an extremely pleasant machine in its own right. The Roadster's fabric roof is unusual in a market segment dominated by metal-topped competitors, but the soft-top feels very sophisticated and folds away in just 10 seconds. Plus there are lots of nice 'open car' features such as heated seats and head-level heating. Ultimately, the TTS does feel like a coupe version of the VW Golf R  perhaps not too surprising as that isn't too far away from what it actually is (other than looking sensational and having that all-important Audi grille).